What a simple packing solution – too bad it took so many years to come up with this obvious solution to prevent the SOAK from leaking – thankfully one of my customer had this brilliant idea of shipping in canning jars. Due to being glass and considering it still has to have protection from breakage, if it’s travelling a long distance, I won’t be able to ship the 64 ounce out of Arizona as the freight would be sky high due to the jar being so big and extra wrapping – in that case I will probably ship the plastic container. The smaller sizes are not an issue. This POWER SOAK is available in three sizes – 16 oz, 32 oz and 64 ounces (1/2 gallon breaks down to $9.00 a pound). It’s very strong product so just a little dab will do you. 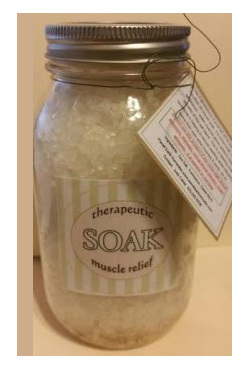 The aroma is like no other – a blend of Eucalyptus Oil with Sweet Birch (has analgesic, anti-inflammatory properties- a natural form of aspirin) there is nothing like a foot or tub soak to help in relieving pain and discomfort as well as easing breathing ailments, & headaches. A very concentrated soak and you can actually see the essential oils glistening in the container. Sweet Birch is a harder to come by oil and similar to Wintergreen but more of a premium oil. It’s a sweet smelling mint. I am partial to Foot Baths as the oils enter through the bottom of the feet and move through the bloodstream within 30 minutes or so. In France they do a lot of foot baths in lieu of traditional medicines. When soaking (water must be above ankle) as the essential oils move through the blood stream they do not effect the digestive system and also don’t stay in a person’s organs like the pills do. This soak, as with all of my products, is extremely concentrated. Use only about 2 tablespoon in a tub for a 20-minute soak, and a little less in a foot soak Can be used in a Jacuzzi, vaporizer or a 30-minute foot bath. Nice before bedtime to relax, with a glass of wine or a cup of tea and take some time to pamper yourself. Do Not Use if pregnant, have diabetes, high blood pressure or heart problems, if you are nursing, on blood thinners or any other major health problems. Sweet Birch is similiar to Wintergreen.